We are excited to inform you that the Black Future Month art exhibition will be returning to OCAD University for 2016 as part of the Black History Month Program at OCADU. The 4th Annual BLACK FUTURE MONTH 3016 Art Exhibition will be spread across campus between the Ada Slaight Gallery Space (Transit Space) in 100 McCaul, the Open Gallery Space in 49 McCaul St. and the Graduate Gallery at 205 Richmond st. The Exhibit will consist of OCAD U students, alumni, staff and Faculty along with select artists from the Black Community. The 4th Annual BLACK FUTURE MONTH 3016 Art Exhibition is a professional curated platform that was created in 2012 by OCADU alumna Danilo McCallum. Now in its 4th edition of the exhibit, it is dedicated to showing work of artists who identify as being of African decent to explore the infinite expressions of Afrofuturism, Black speculative fiction, Afro-Surrealism and other expansive themes like Black identity, culture and existence in the future, real or imagined. Installation begins February 1st and exhibit will run to March. We are excited to inform you that the Black Future Month art exhibition will be returning to OCAD University for 2016 a part of the Black History Month Program at OCADU. Ontario’s 21 universities are sparking a conversation about the future. The pace of change is rapid and accelerating. Disruptive technology, demographic shifts and globalization bring tremendous opportunities, but all that uncertainty can also make people anxious. Universities want to have a conversation with the public about what we can all do together to help shape tomorrow, and to make sure no one is left behind in this fast-changing world. Universities want to hear from everyone who shares their interest in the future of Ontario. Universities want to tap into the hopes and aspirations as well as the concerns about the future of students and parents, but also businesses, health and social service agencies, arts and cultural creators, not-for-profits, researchers, municipal governments and more. Universities are asking students, parents, faculty, employees and the public to take our survey on the future at ontariosuniversities.ca, and also to share their ideas about creating a brighter future through a series of one-on-one meetings, roundtables and discussions universities will be holding over the coming academic year. We have created a discussion booklet that we hope will spark the dialogue. It can be found at ontariosuniversties.ca and contains several conversation starters on a variety of subjects, but we know the conversation is limited only by imagination. Ontarians can also send their feedback by email to insights@ontariosuniversities.ca, or they can share their ideas through a variety of social media platforms - Facebook, Twitter, LinkedIn, Snapchat and Instagram - at @futuringON or by searching Ontario’s Universities. Universities will be distilling those ideas and concerns and reporting back to the public through the ontariosuniversities.ca website, social media and in a series of reports. To continue the dialogue about how we can create a brighter future for everyone, universities will hold a summit in 2017. 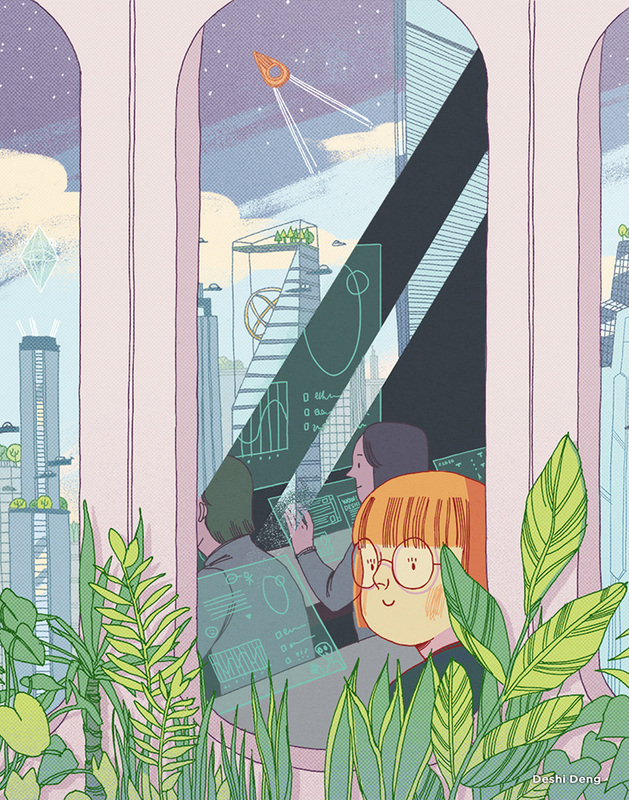 For INSTUDIO’s March illustration feature, 2015 grad Deshi Deng rejects the dystopian, offering her take, instead, on a better tomorrow. View more of Deshi’s work online. With great anticipation, returning to OCAD University for the second year in a row, BLACK FUTURE MONTH 3016 is a part of BLACK FRACTALS, the 2016 Black History Month Program at OCAD U. Presently in its fourth year, the Black Future Month 3016 Art Exhibition is the longest consecutive annual Black art exhibit in Toronto. The overarching theme of the fourth Annual Afrofuturism Art Exhibition is exploring the infinite ways of beings in the far-off distant future as envisioned by Black people over the spectrum of a 1000 years from now. The exhibition serves as a professionally curated platform that consists of OCAD U students, alumni, staff and faculty along with selected artists from the Black community. This initiative was created in 2013 by OCAD U alumnus Danilo McCallum. This year's exhibition will be spread between the Ada Slaight Gallery Space in 100 McCaul St. and the Graduate Gallery at 205 Richmond St. W., with another satellite location at the Art Gallery of Mississauga. This year's exhibition features work from OCAD U's very own Tennesha Skyers, Camille Lauren, Sheniece Cater, Nathan Vernon, Kadicha Foster, Aaron Jones, Quentin VerCetty, Alecia Doley, Danilo McCallum with additional works from BLACK KIRBY (Stacey Robinson and John Jennings, Buffalo, NY) Maliciouz Art (Montreal, QC), Kalkidan Assefa (Ottawa, ON), Jabari “Eliscer” Elliott, Yannick Anton, Mosa McNeilly (Guelph, ON), Wolf J. McFarlane, Anthony Gebrehiwot, OBUXUM, and Black Toronto 2116. BLACK FUTURE MONTH 3016 is considered one of the top events happening in the city for Black History Month! Born in Constantine, Algeria, in 1971 and currently living in Paris, Abdessemed exploded onto the international art scene in the mid-1990s as France’s most exciting artist in over a decade. His expansive practice incorporates drawing, video, ceramics, performance, installation and other media into a visual language that ranges from subtle and sentimental to bombastic and outrageous, often probing the awkward gap between what we believe to be ‘good’ and what we know to be true. Exhibition Opening Reception: Friday, November 26, 7 to 10 p.m.
Curator’s Tour with Charles Reeve: Thursday, December 2, 6:30 p.m.
Free Public Lecture by Adel Abdessemed: Thursday, November 25, 8 to 9:30 p.m.
What do future cities look like? Something out of post-apocalyptic sci-fi movie, or something equally imaginative, but biologically sustainable and ecologically renewable? The Biological Urbanism exhibition on now until February 22 at the Onsite [at] OCAD University gallery blends architecture, landscape, urban design, biology, engineering and art to explore possible futures. In planning the exhibition, the gallery’s curator Lisa Deanne Smith looked at the relationship of design to the topic of sustainability, and one organization kept coming up in her research. She got in touch with Terreform ONE [Open Network Ecology], a non profit architecture group for smart city design, ecological planning and public art based in New York City and began planning a design exhibition with the designers there. The ideas driving this exhibition are of the dramatic, overarching ilk — world population growth, megacities, climate change, renewable energy generation, healthy living. The intention of the research and works on display is to explore the consequences of radical changes to global cities, explore how the world is adapting to address these changes and imagine what could happen in the future. -A large-scale “Bio City Map” that uses mathematical interpretations of the future together with petri dishes of bacteria and “bacteriography” (bacterial photography) to forecast the world population distribution in the next 100 years. -A model of the 38,000 tons of waste New York City produces every day, with a vision for how cities can reuse and repurpose to radically shift the relationship of waste to supply. -A large-scale model of Brooklyn in 2110, as a city of the future producing everything it needs to sustain itself within its physical borders.